Bill Moyers interviews Simon Johnson, who was formerly the chief economist for the International Monetary Fund and democratic Congresswoman Marcy Kaptur from Ohio, about what has changed after the economic crisis. The worst economic crisis in America since the Great Depression in 1929, triggered an attempt at strong economic reforms. 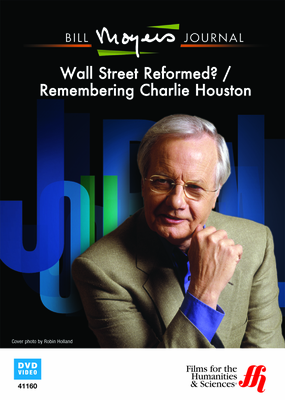 Bill Moyers asks two questions: 1) Has anything really changed in how Wall Street operates? 2) What are the chances of future crises occurring? Bill Moyers starts this interview with an excerpt from Michael Moore’s film “Capitalism; A Love Story”, where Michael Moore asks Congresswoman Marcy Kaptur if she agrees what Wall Street has done is the equivalent of a financial coup d'état. She agrees. Marcy Kaptur has served fourteen terms in Congress, the longest time a Democratic woman has achieved in the House and she is an outspoken watchdog. Simon Johnson also joins in the discussion. He was the former chief economist for the International Monetary Fund. They review and discuss the effects of the bailouts and talk about how unsuccessful reform efforts were. They all agree the financial system is about having access to the power brokers and Wall Street has more access and influence than even Congress. Bill Moyers gives an example of a story from Associated Press stating that Wall Street Bankers talk several times daily with Treasury Secretary Geithner on the telephone, while members of Congress have to leave messages. They conclude there is an excessive influence on U.S. governmental policies by incompetent bankers. Also included in this broadcast is a tribute to Dr. Charlie Houston who was both a famous physician and a skilled mountain climber. Bill Moyers finishes the show with an essay about how lobbyists are controlling the agenda for health care reform. This television show was originally broadcast on PBS October 9, 2009.